The UPSC CDS (II) 2014 General Knowledge Question Paper helps the aspirants in understanding the distribution of marks among various sections and sections of the question paper. Accordingly, aspirants are supposed to prepare their study plan. For the benefit of CDS (II) Exam 2017 aspirants, Jagran Josh is providing you the CDS Exam (II) 2014 General Knowledge Question Paper as well as the official answer key as given by the UPSC. It helps the aspirants in understanding the distribution of marks among various sections and sections of the question paper. Accordingly, aspirants are supposed to prepare their study plan. 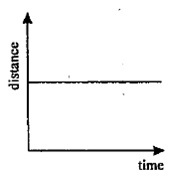 The distance-time graph for an object is shown above. Which one of the following statements holds true for this object? 10. Which one among the following is the generic name of the causal organism of Elephantiasis? 11. Which one among the following statements is not correct? 12. Which of the statements given below are correct? 1. A person having blood group 'A' can donate blood to persons having blood group 'A' and blood group 'AB'. 2. A person having blood group 'AB' can donate blood to persons having blood groups 'A', 'B', 'AB' or '0'. 3. A person with blood group 40' can donate blood to persons having any blood group. 4. A person with blood group '0' can receive blood from the person of any of the blood groups. 13. Which one among the following is the correct pathway for the elimination of urine? 14. Which of the following parts are found in both plant and animal cells? 15. Which of the following statements is/are correct? 1. Coronary artery supplies blood to heart muscles. 2. Pulmonary vein supplies blood to lungs. 3. Hepatic artery supplies blood to kidneys. 4. Renal vein supplies blood to kidneys. 16. Which of the following was the theme of World Environment Day 2014? (a) Green Economy. Does it include you? 17. Which one of the following types of pesticides is convenient to control stored grain pests? 19. Which one among the following pairs is not correctly matched? 20. Which one among the following cattle breed produces highest amount of milk? 27. Which one among the following is an example of chemical change? (c) The frying of an egg. 28. Which of the following is not correct about Baking Soda? 30. Which of the following are the most important reason/reasons of flood becoming a destructive natural hazard in the Ganga-Brahmaputra valley? 32. Plate tectonics is a scientific theory that describes the large scale motions of Earth's lithosphere. Which one among the following statements regarding Plate tectonics is not correct? 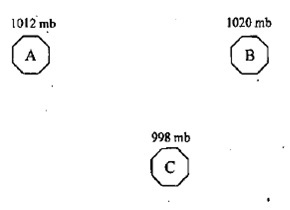 The above diagram represents the pressure conditions of three different places, viz., A, B and C. Which of the following is the correct direction of movement of winds? 1. The large scale exploitation of ground water is done with the help of tube-wells. 2. The demand for ground water started increasing with the advent of green revolution. 3. The total replenishable ground water reserves is highest in the hilly tracts of Sikkim, Nagaland and Tripura. 4. National Buildings Construction Corporation Ltd.
37. Which one of the following would have happened if the Himalayas did not exist? 39. Which of the following statements regarding jhum cultivation in India are correct? 1. It is largely practised in North-Eastern Indian states. 2. It is referred to as 'slash and burn' technique. 3. In it, the fertility of soil is exhausted in a few years. 41. Which of the following statements relating to Indian agriculture is/are correct? 1. India has the World's largest cropped area. 2. Cropping pattern is dominated by cereal crop. 3. The average size of an Indian farm holding is too small for several agricultural operations. 44. Which of the following is/are basically meant to be deployed in the northern borders of India for monitoring the borders and also to stop smuggling and illegal immigration? 45. Which of the following is/are the potential threat to safety of large dams? 46. The Equatorial region has no other season except summer. What could be the reason? 1. The Non-Aligned Movement (NAM) was created and founded during the collapse of the colonial system and the independence struggles of the peoples of Africa, Asia, Latin America and other regions of the world and at the height of the Cold War. 2. The First Summit of the Move-ment of Non-Aligned Countries was convened by the leaden of India, Indonesia, Egypt, Syria and Yugoslavia at Belgrade on September 1 —6, 1961. 3. During the early days of the Move-ment, its actions were a key factor in the decolonization process, which led later to the attainment of freedom by many countries and to the founding of several new sovereign States. 4. The fundamental principle of the movement is to maintain equal distance from both the super powers by joining the military alliances of both the blocs. 1. The World Bank was established in 1946, which is headquartered in New York. 2. The World Bank Group has set for itself the goal to end extreme poverty from the World by 2030. 4. The World Bank Group comprises five institutions managed by their member countries in order to promote shared prosperity by fostering the income growth of the bottom 40% for every country. 50. Which of the following statements about International Monetary Fund (IMF) are correct? 1. The IMF is a United Nations specialized agency. 2. The IMF was founded at the Bretton Woods Conference in 1944 to secure international monetary cooperation. 3. The objective of the IMP is to stabilize currency exchange rates, and to expand international liquidity (access to hard currencies). 1. The WTO deals with the global rules of trade between nations. 2. The goal of the WTO is to help producers of goods and services, exporters, and importers conduct their business. 3. The WTO, which is a successor body of the General Agreement on Tariffs and Trade, came into being following the Uruguay Round of Negotiations. 4. The WTO distances itself in framing of rules on trade in intellectual property rights. 1. Article 40 of Indian Constitution provides for the State to organize village panchayats and endow them with such powers and authority as may be necessary to make them function as units of self-government. 2. The 73rd and 74th Constitution Amendments inserted Part IX and IX A in the Constitution. 3. The provisions in Parts IX and IX A of Indian Constitution are more or less parallel and analogous. 4. The 73rd Constitution Amendment is applicable to all states irrespective of size of population. 53. Which of the following is not correct regarding the 2014 FIFA Football World Cup? 54. World Bank in June 2014 released a study report on India's Power Sector titled 'More Power to India: The Challenge of Electricity Distribution'. Which of the following is/are the key recommendation(s) of the report? 55. Which of the following is/are department(s) in Ministry of Defence? 1. The State Election Commissioner shall be appointed by the Governor of the State. 2. The State Election Commission shall have the power of even preparing the electoral rolls besides the power of superintendence, direction .and control of election to the panchayats. 3. The State Election Commissioner cannot be removed in any manner from his office until he demits himself or completes his tenure. 57. Which of the following is/are Para-military Force(s) of India? 59. Which of the following statements about Indian Judiciary is not correct? 60. Which among the following about the Rangarajan Panel Report on poverty estimation (submitted in July, 2014) is/are correct? 62. Which of the following statements about India-Sri Lanka relations is/are correct? 1. India and Sri Lanka have a Free Trade Agreement. 2. India has emerged as .the highest exporter to Sri Lanka as on May 2014. 63. Which among the following is/are correct statement about Malawi? 1. It is an association governed by Swiss law, founded in 1904 and based in Zurich. 2. FLEA has been engaging with, its stakeholders and other institutions to find sensible ways of addressing environmental issues and mitigate the negative environmental impacts linked to its activities. 1. The SAARC Secretariat is located at Kathmandu. 2. The Secretariat is headed by the Secretary General, who is appointed by the Council of Ministers from Member States in alphabetical order for a three year term. 3. The Secretary General is assisted by eight Directors on deputation from the Member States. 1. SAFTA is a trade liberalisation programme among the South-Eastern countries of Asia. 2. According to SAFTA, the Ministerial Council shall meet at least once every year or molt often as and when considered necessary by the Contracting States. 1. BIMSTEC has seven members —Bangladesh, Bhutan, India, Myanmar, Nepal, Sri Lanka and Thailand. 2. BIMSTEC provides a link between South Asia and South East Asia by way of economic cooperation and linkages in identified areas of cooperation. 3. BIMSTEC was rechristened as BISTEC in the year 2014. 70. Which of the following about the principles of Panchsheel are correct? 1. Government of India has recently upgraded the National Industrial Classification from NIC-1987 to NIC-2008. 2. NIC is an essential statistical standard for developing and maintaining comparable database according to economic activities. 1. It was a joint exercise of Indian Army, Navy and Air Force. 2. The overall aim of the exercise was to practise conventional cross-border thrusts into enemy territory. 75. Which one among the following is a state-of-the-art acoustic sensor-based target training system developed by the CSIR for shooters of the Indian Army? 76. Which of the statements given below about the Mughal rule in India is false? 77. The Ghadar party, formed in the USA, was determined to start a revolt in India. Which among the following provinces did the party choose to begin its armed revolt? 1. The colonial economy in Vietnam was primarily based on rice cultivation and rubber plantations. 2. All the rubber plantations in Vietnam were owned and controlled by a small Vietnamese elite. 3. Indentured Vietnamese labour was widely used in the rubber plantations. 4. Indentured labourers worked on the basis of contracts that did not specify any rights of labourers but gave immense power to the employers. 80. Which of the four linguistic regions in South India remained unaffected by the Non-Cooperation Movement (1921-22)? 81. Which of the following statements about the penetration of English into Bengal is/are correct? 82. Under the forceful thrust of British rule, a rapid transformation of the Indian economy took place. In this context, which of the following statements is/are correct? 1. 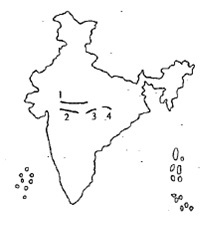 Indian economy was transformed into a colonial economy in the 19th century whose structure was deter-mined by Britain's fast developing industrial economy. 2. The influx of cheap Indian products into England gave a great blow to English textile industries. 3. The 19th century saw the collapse of the traditional Indian village economy and fresh economic alignment along commercial lines. 83. Which of the following statements is/are correct? 1. Early Buddhist literature is generally composed of the canonical text. 2. The Buddhist schools classify their canonical literature as only the Pitakas. 85. Statement I : The twelfth century witnessed the emergence of a new movement in Karnataka led by a Brahmana named Basavanna. Statement II : The Lingayats worshipped Shiva in his manifestation as a Linga. 86. Statement I : Ram Mohan Roy in his famous work Gift to Monotheism put forward weighty arguments against belief in many Gods and for the worship of a single God. Statement II : Ram Mohan Roy in his Precepts of Jesus tried to separate the moral and philosophic message of the New Testament. 87. Statement I : The Bethune School, founded in Calcutta in 1849 was the first fruit of the powerful movement for women's education that arose in the 1840s and 1850s. Statement II : The first step in giving modern education to girls was undertaken by Vidyasagar in 1800. 88. Statement I : The annexation of Awadh by Lord Dalhousie in 1856 adversely affected the financial conditions of the sepoys. Statement II : The sepoys had to pay higher taxes on the land where their family members stayed in Awadh. 89. Statement I : During indigestion, Milk of Magnesia is taken to get rid of pain in the stomach. Statement II : Milk of Magnesia is a base and it neutralizes the excess acid in the stomach. 90. Statement I : A tsunami is a series of water waves caused by the displacement of a large volume of water of an Ocean. Statement II : A tsunami can be generated when thrust faults associated with convergent or destructive plate boundaries move abruptly. 91. Statement I : The Atacama is the driest among the deserts of the World. Statement II : The aridity of the Atacama is explained by its location between two mountain chains of sufficient height to prevent moisture advection from either the Pacific or the Atlantic Ocean. 92. Which one among the following pairs is not correctly matched? 94. Which of the, following statements is/are true? 1. If increase in demand and supply are of equal magnitude, the price will remain unchanged, but the equilibrium quantity will increase. 2. If increase in demand is of greater magnitude than increase in supply, both equilibrium price and equilibrium quantity will increase. 3. If increase in supply is of greater magnitude than increase in demand, equilibrium price will fall but equilibrium quantity will increase. 97. Which of the following statements are correct? 1. When marginal revenue is positive, total revenue increases with increase in output. 2. When marginal revenue is zero, total revenue is maximum. 3. When marginal revenue becomes negative, total revenue falls with increase in output. 99. Which of the following theories form the basis of international trade ? 100. Which one among the following is not a source of tax revenue for the Central Government in India? 101. Which of the following does not form part of current account of Balance of Payments? 105. Which of the following statements about Marrakesh Treaty is/are correct? 1. The main goal of the treaty is to create a set of mandatory limitations and exceptions for the benefits of the blind and visually impaired. 2. India has ratified the treaty. 3. The treaty has come into force from July 2014. 1. It offers free enhanced satellite navigation signals over India which are ten times more precise than GPS. 2. It was developed jointly by ISRO and NASA. 109. Which one among the following is not a Command of the Indian Army? 2. The Bill fixes the maximum sentence available for the most serious offenders up to 14 years. 1. The Project was launched in June 2014 by the Ministry of External Affairs. 2. At the macro level, the project aims to reconnect and re-establish communications between countries of the Indian Ocean world, which would lead to in enhanced understanding of cultural values and concerns; while at the micro level, the focus is on understanding national cultures in their regional maritime milieu. 115. Which of the following is not the recommendation of the Arvind Mayaram Committee on Rationalizing the FDI/FPI definition (June 2014)? (d) On NRI Investors, the Committee recommended treating non-repatriable investment as FDI 116. 1. Established in the year 1997, it is the leading global airline network with the highest number of member airlines, daily flights, destinations and countries flown to. 2. Air India has recently joined the Star Alliance in a bid to gamer more revenue. 117. Which of the following statements is/are correct? 1. In June 2014, the World Heritage Committee has inscribed the Great Himalayan National Park Conservation Area (GHNPCA) on the World Heritage List on the basis of UNESCO Guidelines. 1. World Vitiligo Day is observed on 25th June every year. 2. Vitiligo is a progressive skin disease.